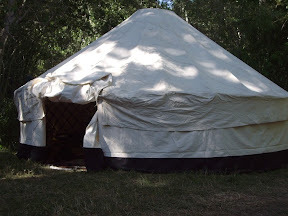 About mid week at chaos wars we had some new neighbors set up yurts next to us. They were home made and very nice so I snapped a few photos. For me, making steel armour was one of those things that was an unattainable idea. I didn't have any idea how it was done, no idea what tools were needed. I just knew that I didn't know. But I tried anyway, I am sure anyone who knows anything about armour smithing will get a headache from the pain inflicted by my poor technique but at least I tried. These tutorials are more proof that if you try to do something you can get some pretty descent results. So with the cheviot that I really have/had no idea what I was doing, if you follow these tutorials you can begin your journey in to the wonderful world of steel. To get myself going I am going to post a series of articles linking to my most popular tutorial collections. The first is about my "famous" Rag Rug garb. Rag rugs are very versatile, cheep, and easy to work with. The possibilities of how to put them together are endless, I have come up with 2 methods that work well. Rag rugs garb, some people love it, some hate it. I call them "poor man's gambesons". 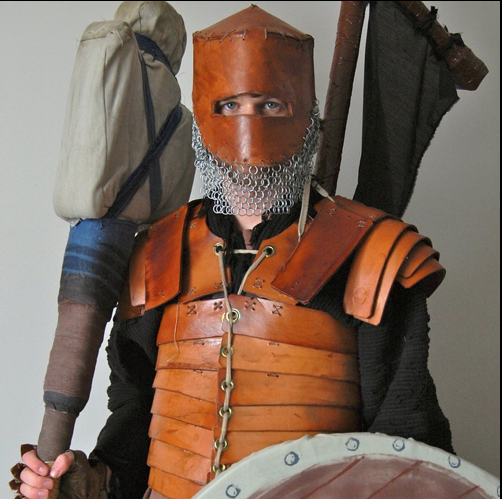 Though they don't offer any real physical protection like a proper gambeson they do offer a fighter many of a gambeson's other benefits. They offer a good bit of padding to hard blows that takes the sting off if you have sensitive skin, they offer great padding for chain mail and other armours making them more comfortable to wear and get hit in, they breath very well in hot weather because of the large loos weave, and also provide insulation and warmth in cold weather. Rag rug garb can be very simple to make, it can take less than 2 minutes to put together a simple tabard/vest and perhaps an hour to but together a full coat. I find my rag rugs at a dollar store (dollarama) for $1-$2 a peace, making the cost range from $2-$8 for a peace of garb. A spear man in a rag rug tabard. My armor got beet up pretty good this day, and the flag wasn't properly attached to the poles until the second half of the day, but I was happy with it. See you in a few months! Ok, So I got to work on this project the other day, I am really happy with how it turned out, I cant wait to try it out in combat! Here is how I make it, step by step, and just a warning, I used duct tape like crazy, no glue. Not exactly kosher in foam smiting I know, but I had a duct tape itch that needed to be releaced.